Known for its petroleum, Texas also leads the way in high-tech exports. 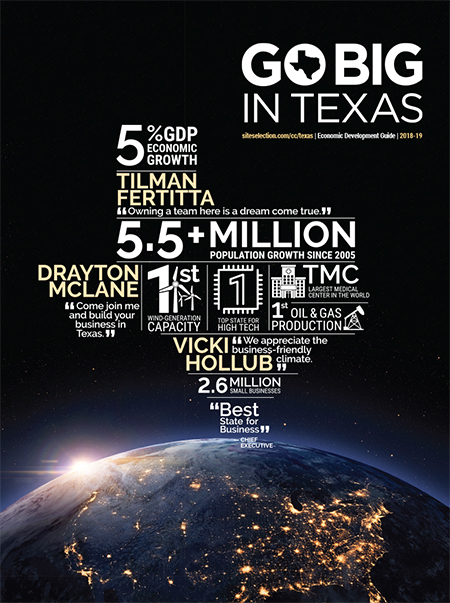 Texas is America's export powerhouse. In 2017, the Lone Star State blew away all comers to further cement its reputation as the No. 1 exporter in the US, a position it has held since 2002. Led by petroleum products, Texas exported $264,086,000,000 — more than a quarter-trillion dollars — worth of goods last year, accounting for a whopping 17.1 percent of the country's outbound trade. The state's 2017 exports exceeded those of No. 2 California by more than 50 percent. While Texas is widely known as the nation's largest oil and gas producer, its success as an export dynamo draws strongly from its talent at making and growing things. Besides petroleum, top Texas exports include computer parts, civilian aircraft engines, computer processors, telephone equipment and cotton. Electronics and transportation equipment are the leading Texas-made products shipped to Mexico, the state's top outbound trade partner. In 2017, Mexico accounted for 37 percent of Texas' export revenue, followed by Canada (8.6 percent); China (6.2 percent); Brazil (3.8 percent) and South Korea (3.7 percent). Texas enjoys a strategic location on the Gulf of Mexico. With 16 seaports, 26 commercial airports, 28 border crossings with Mexico and the nation's largest network of freight rail and public roads, the state offers international companies dozens of points of entry. Three of Texas' ports are among the Top 10 in the country, with Houston generating more trade value than any other US seaport on the Gulf Coast. The port of Laredo is the number-one inland port along the entire US-Mexico border in total trade volume and value. Tellingly, 92.9 percent of all Texas exporters are small businesses. The Office of the Governor's Texas Exports Assistance Program helps small-to-medium sized business to create and expand their products and services into new export markets. The State Trade Expansion Program (STEP), funded through a grant from the US Small Business Administration, is designed to offer eligible Texas businesses technical assistance, export research, market expansion opportunities, participation in state-led trade shows, and financial support to conduct individualized export activities. The STEP program offers Export Assistance grants of up to $7,500 per year.